How do you grow speech and language skills in your preschool therapy sessions this spring? Try these songs and fingerplays! When you think about spring, what comes to mind? Gardens, worms, rain showers, bunnies, and flowers? Check. Chicks, ducks, butterflies, bugs, caterpillars, frogs and rainbows? Yep. All super-appealing themes that preschoolers and kindergarteners really get excited about. So use 'em to engage and captivate little ones in speech therapy. Even my not-so-little ones love these topics. If you've been hanging with me for a while and reading my posts, you know I love using themed activities in my therapy sessions. It's a fabulous way to activate a child's background knowledge and provide a foundation for rich language experiences and learning. 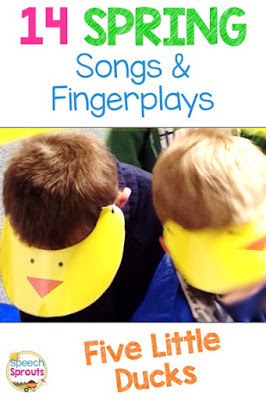 I'm a huge fan of songs, rhymes, fingerplays and movement activities for preschool speech therapy. 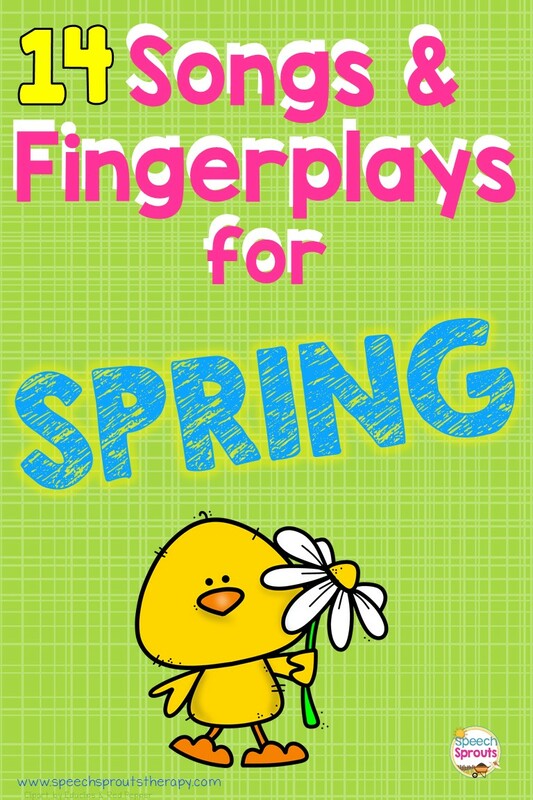 14 Preschool Songs and Fingerplays for Winter Speech therapy. Can you seriously target speech and language skills while singing, dancing and having fun? Repetition: Repeating words and phrases in songs offers multiple opportunities to practice. Don't sing the song or do the fingerplay just once. Enjoy the same one several times in a session and over multiple sessions. Repetition is powerful! Pacing: If you are following along with a video to present the song, be sure to choose a video with a slightly slower pace. Many are too fast for our language-delayed students to keep up. Pre-teaching: Start by teaching the words and motions at a slower pace... you can speed up a bit later. Using visuals: Use pictures, story-telling pieces or other visuals. A picture IS worth a 1000 words and can help your children comprehend and focus. And... a few ideas to go with them to expand on the theme and build vocabulary in your speech and language sessions. 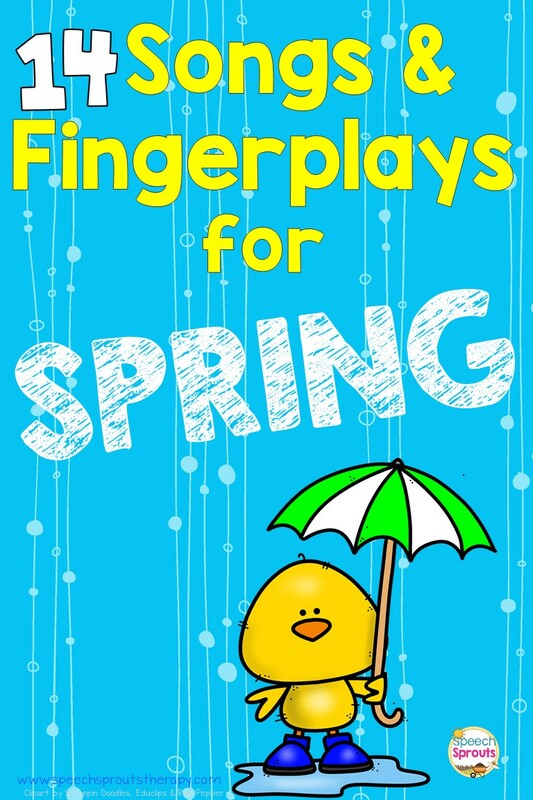 The King County Library System has a great list including videos so you can see how the fingerplays and motions are done. Using music, rhyme and rhythm really engages children when teaching language skills. Little Raindrops Falling Down, sung to the tune of London Bridge, repeats "falling" for practice with initial /f/ and -ing verb endings. You can also target size concepts as the drops are "little" at first, then "bigger" then "giant." Come Under My Umbrella repeats the word umbrella (great for syllables practice) and come for initial /k/ articulation practice. I also like it for weather words: thunder, lightning, and rain. Why not open a big umbrella and let the children come "under"? Bring a spray bottle, put it on mist, and make it rain. The kids will love it! Then try "under" a few more things... the table, maybe your desk or a cardboard box. Gilly's Galoshes is fun as Gilly splishes and sploshes. This rhyme is great for practicing "she." and s-blends too. Bring a pair of big rainboots in for the children to stomp around in and act out the story. Rain is Falling Down in Drops is sung to the tune of the Ants go Marching. It repeats "drops" and adds in "stops" for final s-blend practice. Dig, Dig, Dig the Earth is sung to Row, Row, Row Your Boat. You'll practice final /g/, and talk about seeds, rain, sunshine, and flowers. Bring in a flowerpot with real seeds and dirt, or fill one with black beans. Use a few beans of a different color to "plant." (seeds). Count them, one seed, two seeds, three seeds... great plurals practice. What will the seeds and plants need? Where do the seeds go? Inside the pot, under the "dirt" What did you do? (Past-tense verb practice: planted, watered.) What will happen next? Before your students arrive for their next session, add some silk flowers to the pot. You grew these flowers! What happened? 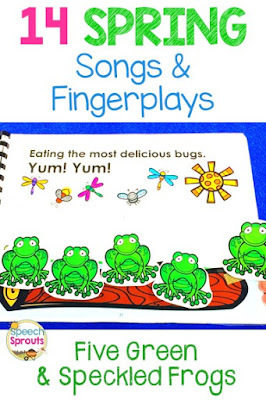 The Farmer Plants the Seeds This song and fingerplay repeats seeds and crops (plurals practice). There's also plenty of verb practice: plants, comes, begins, picks. Explore the farmer and "crop" theme and bring in a few veggies. Cut them in small pieces and have a tasting. How are they alike? Different? Are they crunchy? Juicy? Name some that are green. Which ones are yellow? Teach basic categories and sort pictures of vegetables and fruit or better yet use play food and sort them into baskets. Ladybug, Ladybug by Frank Leto is a fun song with a slightly slower pace. The little ladybug crawls on a thumb, wrist, arm, elbow, ankle, and leg... perfect for naming body parts and initial /l/ practice. If you have a little toy ladybug, have it 'crawl" on the children as you sing. They squeal and laugh, it's so cute! Caterpillar Change is a fun little fingerplay that's great for simple wh questions. What is he doing? (crawling) Where is the caterpillar? (inside) What happened? "There was a little caterpillar crawling all about..." Of course, he wraps himself into a cocoon (change that to chrysalis if you like) and becomes a butterfly. 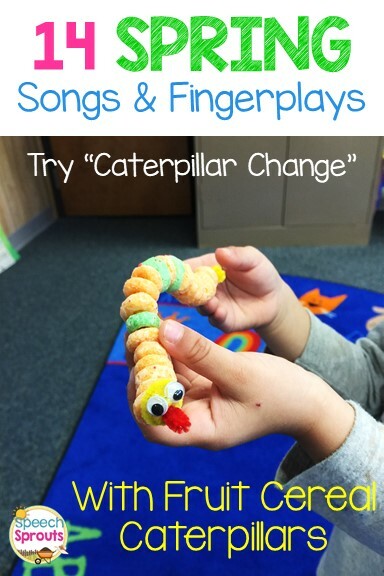 Follow up by reading the Hungry, Hungry Caterpillar and make some little caterpillars to take home. These fruit cereal caterpillars were a big hit with my preschoolers! A pipe cleaner, wiggle eyes and fruit cereal make this yummy caterpillar. Wiggle Worms by Dr. Jean will have your little ones giggling as the worms wiggle everywhere. This fun little fingerplay is great for opposites, position concepts and of course, there's plenty of initial /w/ practice too. Wiggle your worms up, then wiggle them down. Wiggle your worms around and around. Five Green and Speckled Frogs by the Kiboomers is a Youtube video with cute illustrations and a nice child-friendly slow pace. I especially like the Kibbomers videos for this reason. You can target initial /f/ (five) and /sp/(speckled) as well as plurals (frogs) and position concepts in and on. Make some playdough logs and frogs after singing or play "in the pond, on the log (or bank) and work on listening. 1. Use masking tape or a carpet runner and create a "log" on the floor. 2. Tell the children that the area outside the box is "the pond." 3. Have some children start in the pond, some on the log. 4. Tell the children the only time the should move is to jump when they hear either "on the log" or"in the pond". Don't move if it's anything else! 5. Shout "on the log" or"in the pond" and sometimes trick them a little by saying something different, like 'on the rock" or "in the log". 6. With older children who handle competition well, you may want to have children that make a mistake be "out." With little ones, we just have fun playing. 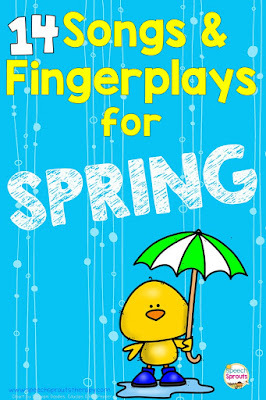 Little Chick Waits by Dr. Jean is perfect for final s-blend and verb practice with "waits, taps, and pops." Five Little Bunnies Song for Kids by The Kiboomers is an easy-to-sing countdown song that repeats "hippity hop and hippity hey." Have anyone working on initial /h/? This is the perfect song. There are several versions of traditional songs, of course. I love the one where Daddy duck quacks at the end! That's the one I used in my Five Little Ducks Unit. Pictures and manipulatives help children re-tell the story. Round out your spring-themed units with books, crafts, and more activities. Make an easy and adorable ladybug craft in this post. This fluffy cotton ball lamb craft is super simple to make. 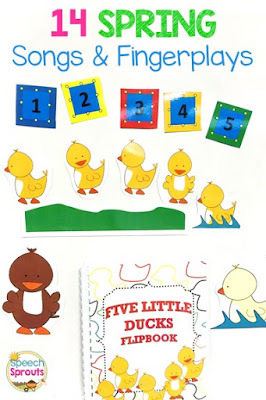 Grab a stamp pad and make this Five Little Ducks fingerprint and handprint craft. And of course, be sure you've subscribed to my newsletter (the signup is in the right-hand column here) so you can download Where's Froggy? activity to go with the Five Green and Speckled Frogs. I hope you enjoy these with your little ones, Happy Spring!